MANSION is a name on the move! The fast-growing and aggressively-promoted online gaming, betting and poker group is certainly splashing the cash in all the right places. Not content with sponsoring the shirts of leading Premiership football team, Tottenham Hotspur, and presenting the Fox Sports poker extravaganza The Poker Dome, it is now literally taking to the air! Mansion has signed an advertising deal with Flybe, a leading European low-cost airline, which will see one of its fleet of BAe-146 jets emblazoned with the Mansion logo for a period of two years. The aircraft made its first appearance in its Mansion livery during a one-off flight to Frankfurt from Luton. Invited guests, VIP’s, media representatives and 50 lucky winners of an online promotion at Mansion.com headed for the World Cup match between England and Paraguay on 10th June ensuring Mansion was on display at the centre of attention for the world’s football fans. 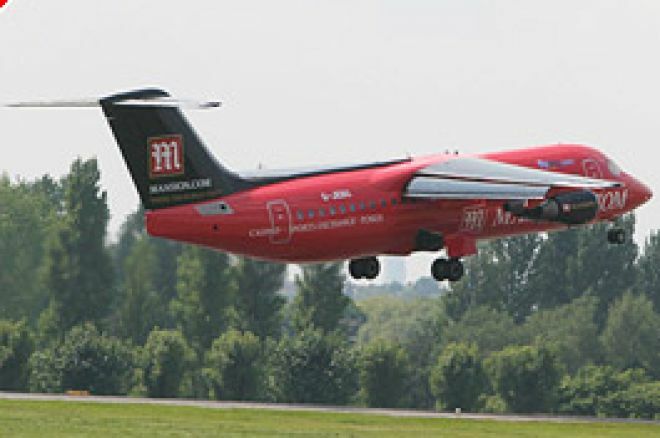 The Flybe jet features the black and red branding of the Mansion corporate logo, which will, quite literally, stand out a mile away and be visible to vast numbers of travelling passengers. In addition to the aircraft painting and World Cup flights, Mansion will also be appealing to millions of Flybe passengers through onboard and executive lounge promotions using multimedia channels ranging from mixed content plasma screens through to specially branded catering trolleys. However, if any non-flying poker players think they will be spared the onward charge of the Mansion brigade, they have another think coming their way. In the USA, the Fox Sports Poker Dome has the best part of nine months to run, by the conclusion of which a huge audience will doubtless be looking in to see which lucky poker player can nail the million dollars. Meanwhile, in the UK, and on TV around the footballing world, the Mansion name will be on show as the exploits of Tottenham Hotspur Football Club are beamed out during the long season beginning in August. UK Poker News thinks it is a safe bet that Mansion will continue to accumulate chips!